With less than 24 hours to go before the Fall Fashionista Giveaway event starts, I have another fabulous sponsor to share with you. Curlies Shoes, from Bernie Mev, are the coolest, funkiest yet comfiest flats, and you’ll have a chance to win a pair! These brand new shoes literally just hit stores, so here’s your chance to get in on what is sure to be a hot trend this season. Curlies are super hip yet incredibly comfortable shoes from Bernie Mev, creators of the Comfi shoes. Each pair provides support by naturally moving and adjusting with the foot. The bed of these super adorable flats is made of responsive memory foam, so each step you take is like walking on a cloud. The foam also helps absorb impact from standing or walking. The composite sole allows for a great grip to keep you from slipping while being incredibly durable. Curlies come in 10 different colors, including the basic, multi-colored, patterned and metallic colors. Since Curlies are launching just in time for the holidays, each pair is packaged in an adorable ornament! After the holidays, they will be sold in a stylish pouch. See, the really cool thing about Curlies is that they curl up to fit in your travel bag! They’re perfect for going from the gym to a night on the town. Toss them in your gym bag, then swap out your sneakers for your super cute Curlies. Along with my other sponsor, Nancy Rose Performance, you have a perfect outfit that takes you from workout to a night out. Curlies are sold at Nordstrom and 1,400 boutiques nationwide and retails for $50. Come back tomorrow (or tonight at midnight) for your chance to win a pair of Curlies and a fabulous Nancy Rose Performance outfit! Are you excited? I know I am! Which color of Curlies do you love most? I am partial to the red with polka dots! Curlies are just what I need! I’m a teacher and stand on my feet all day long, every day. Wearing comfy shoes that look this cute would be perfect. I really like the silver ones! I’m a Librarian, push book carts, shelving books and helping patron means no feet relief. Comfort is my top priority. I love the style as well. How adorable! The red polka dots are my favorite too. I love shoes that are as cute as they are comfy! I wish I had those silver ones for my sisters wedding last weekend! They would’ve been perfect under my long dress! And so comfy too! I agree with you! The red with the polka dots are so cute! These are adorable flats,my daughter would definitely try to take them away from me! These would be great for my job as a massage therapist. I love the red pair. They are super cute and look comfy too. They sure do look comfie! I would love them in any color but the red really speaks to me. They look cute and comfy, would like to give them a try.. I think the red polka dots are the best looking. These shoes are adorable and look like they would be super comfy, which is hard to find in a performance flat! I want some!! I like all of them. I could wear these around the house. The floor is extremely cold in the winter. Cute and comfortable is a winning combination for me! I love those polka dot designs! I LOVE THEM IT WOULD BE LIKE BEING BAREFOOTED THAT WOULD BE GREAT!!!!! I GET YELLLED AT FO NO PUTTING ON SOME KIND OF SHOE BECAUSE OF MY DR. TOLD ME TO!!!! SO THEY WOULD BE GREAT FOR SUMMER!!! BLESSED BE <3!!! I love the designs and prints. These definitely aren’t boring. I would love these flats as a go to for everything! I love the brown polkadotted ones! I need a pair of these desperately!! I think I like the red ones best – torn between red and silver.. These are soooo cute!! I have been dying for a new pair of flats!! These look super comfy! The red and the silver are both so adorable! They look really comfortable too. I would love to try these flats! I love the red! I’m with you…I like the red with polka dots. So cute! These look incredibly comfortable. 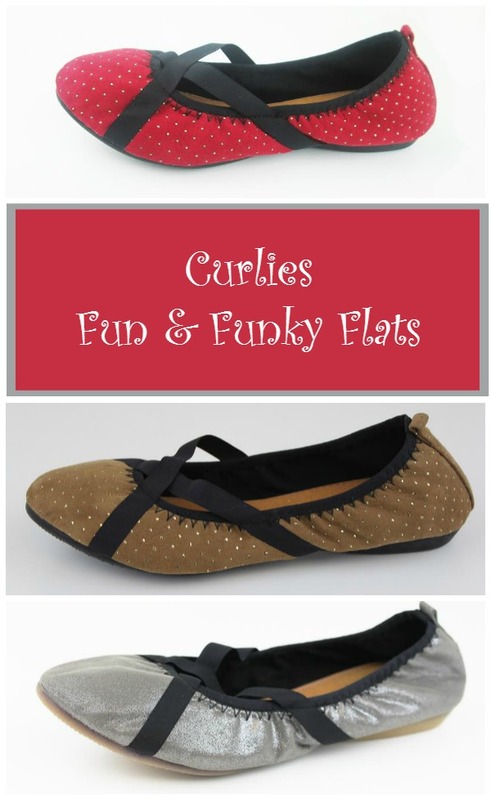 I love the Curlies Fun & Funky Flats. They look so comfy. I would wear them everywhere. The silver flats are my favorite. I really want the flats. I hope I win. Fingers crossed and thank you for the giveaway. These are very cute. I love that they have “responsive memory foam” that sounds incredibly comfortable. I’d love to get a pair of these. Everyone needs a cute pair of flats! Oh these look so comfy. I wish I had them on my feet now. So cute how they’re packaged as ornaments! These would be great to keep at my desk for when my feet are tired of my heels! I like the brown pair and they look comfortable too. Could use as slippers around house. I like the memory foam feature and prefer the red pair. These look very stylish and cozy after a long day at work lounging at home. Definitely the red. How cool are these shoes,I like the red with polka dots, but really love the silver ones, for my old tired feet, I like that they have memory foam to helps provide comfort and amazing feel to our tired feet. I love wearing flats, and these would be so cute to keep in my desk or take with me so when my feet are tired I can switch to flats! I love the cute polka dot design too. These look really comfy. I would like the red pair. My daughter also wants red so we may have a fight ahead of us, lol. These are really cute, I love the elastic straps on them.